Participants will include students from Kenya and Tanzania! MTR ISS 2011 Participants from Nyeri Kenya posing for a photo. Milking the Rhino: Innovative Solutions Showcase started at Penn State University in 2009. Originally, the showcase was open to only Penn State undergraduate students. Thanks to our many sponsors, MTR-ISS 2011 has some new and exciting changes. There will not only be $4,500 dollars in cash awards but 2011 also marks the first year that this competition goes international. Students from at least three African countries (Namibia, Kenya, and Tanzania) will be sharing their insights on how to "Milk the Rhino." We traveled to Namibia, Nyeri, Kenya's Children and Youth Empowerment Center as well as Tanzania's Tumaini University to pitch this competition and Milking the Rhino Innovative Solutions Showcase was met with great interest! For the interested students, we held interactive workshops about key concepts such as economic, environmental and social sustainability. We also were able to provide the partnering institutions with a flip camera and tripod thanks to our sponsors. We then held brainstorming sessions to imagine some of the ventures that the students could create videos about. In fact, most students were already engaged in their very own entrepreneurial venture! We look forward to the the students' contributions to this showcase! 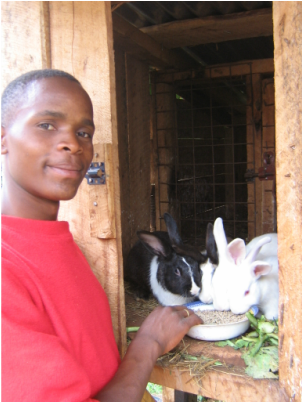 CYEC's Joseph breeds rabbits to sell at a local restaurant/resort. He manages all aspects of the business from building the hutches to caring for the rabbits. Penn State student Rachel at right with Tanzania's Tumaini University student Jacquiline, both MTR participants. The ladies of Kenya's CYEC create their own dresses, clothes, and handbags to sell at fairs and markets. 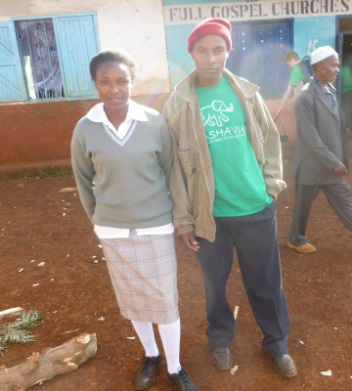 Penn State student Linsday (left) with Jacquiline, a Tumaini University Student who will be participating in MTR ISS 2011. Paul Muya from Kenya, a CYEC student and innovative farmer, eats some fresh macadamia nuts. His MTR ISS proposal involves sharing ideas for drip irrigation, very useful in areas where water is often a scarce resource. On the left, Ester is involved in the CYEC's dress making program. At right, John has developed a highly detailed plan to divert waste water from the kitchens, bathrooms and living spaces into the 'shamba' garden. The plan is currently being implemented.